Hi folks, Doc here. 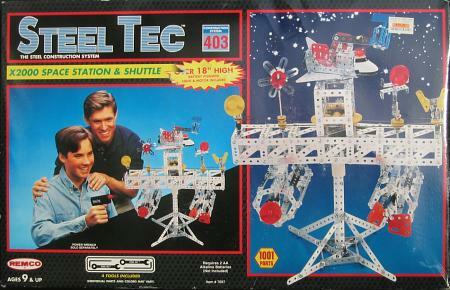 In the early 1990s a latecomer to the metal construction toy industry appeared in the form of Steel Tec, a system manufactured in China and produced and marketed by the Remco Toys division of Azrak Hamway International, Inc. (most baby boomers will recognize the Remco® brand name). 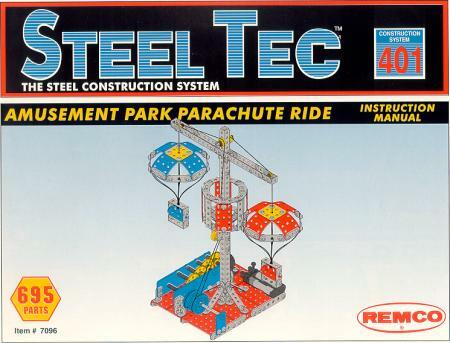 First introduced in 1992, the Steel Tec system had a short and troubled lifespan, lasting only until 1997 when the Remco® brand name was purchased by JAKKS Pacific, Inc. 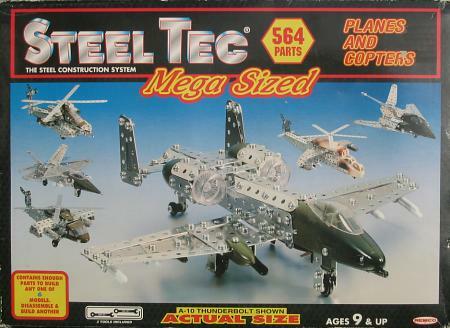 However, it has been reported that the Steel Tec name may yet again appear on a new line of construction sets under development by 4Kidz, Inc. The Steel Tec system was somewhat unique for several reasons. Most of the over 30 different sets that were produced during its five year run were designed to build just a single model. 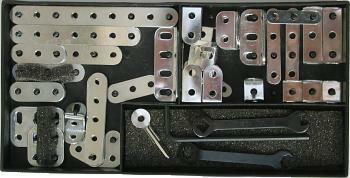 In addition, many sets featured an unusual combination of traditional metal parts (strips, plates, brackets, etc.) and molded and painted polystyrene components. Models built from these sets look like a strange hybrid of plastic scale model kit and metal construction toy (see image at right). These featured models were often vehicles of some type (planes, trucks, spaceships, etc.) 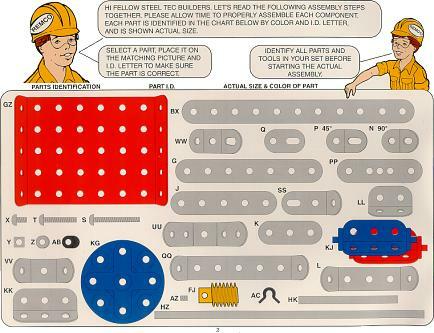 and tended to be small in size, since the largest standard metal part included in most sets was an 11-hole strip. The "traditional" building parts in the Steel Tec system were based on the same ½" (12.7mm) hole spacing found in the Meccano and Gilbert Erector systems. As a result, the parts are generally compatible with either system (compatible is a relative term here, since it was the use of this word in Steel Tec advertising that resulted in legal action by a competitor). The fasteners are compatible only with Meccano, since they feature the same 5/32" Whitworth scale threads (Gilbert Erector fasteners have 8-32 threads). 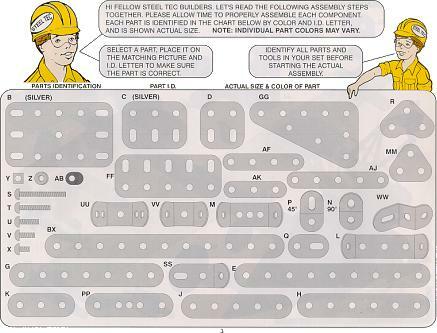 The standard Steel Tec part inventory was more limited than Meccano or Erector, however. 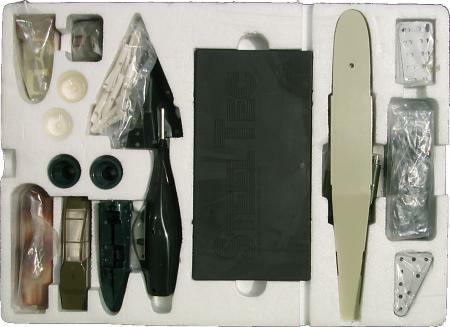 Parts were nearly as often molded plastic as they were made from metal, and were of good quality. As might be expected, strips, brackets and small plates were bright nickel plated metal. Pulleys, larger plates and other specialized parts were either plastic or painted metal; colors were typically red, blue, yellow, or orange. Gears, also plastic, included a ½" worm; a 19T pinion, a 57T gear wheel, a 50T contrate with attached ½" pulley, and a 57T/19T. The longest typical angle girder was a 4-hole, although the Parachute Ride set (shown below) included 17-hole slotted angle girders - an odd size to be sure! Small battery powered electric motors with plastic housings were included in larger sets. Several accessories could be purchased separately for use with Steel Tec sets, including a battery operated Power Wrench and a Work Center/Storage Case. 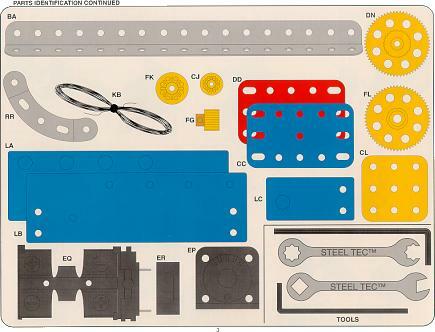 Set manuals were large, sturdy, and well illustrated, with step-by-step model building instructions and part diagrams usually shown in full color (see examples below). 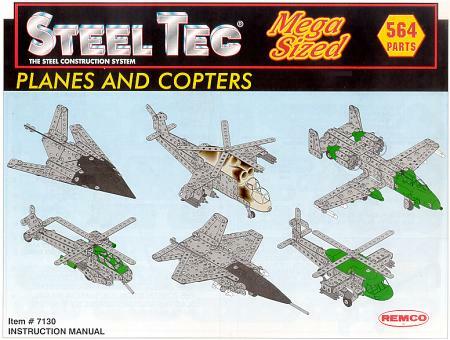 As I mentioned previously, there were over 30 different sets in the Steel Tec line. Several of the largest and most interesting sets are shown in the images below. Set boxes were almost always made of thin cardboard, with glossy full color photos of the feature model(s) on the cover. Larger set boxes, like those shown below, could be opened at either end by way of an unusual folded tuck-in flap. Set contents were arranged in molded styrofoam trays. At the center of each tray was a flat rectangular plastic box with a snap on lid that contained most of the small strips and brackets (see below). Beneath this box in a compartment in the styrofoam tray, the screws, nuts and the remainder of the small parts were stored in plastic bags. At 1001 pieces, the No. 7097 X2000 Space Station & Shuttle (shown above) was the largest Steel Tec set. Its signature model was motorized and lighted, and stood over 18" tall when completed. The No. 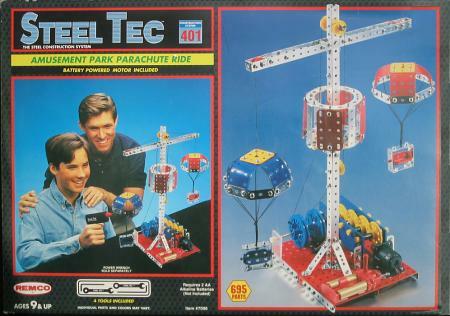 7096 Amusement Park Parachute Ride set (shown above) contained 695 pieces. The feature model was motorized and fully operational, with two parachutes suspended from a horizontal arm. I'll be presenting this model in the Model Gallery in the near future. 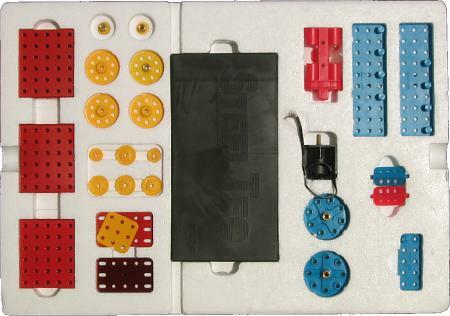 The set contents, manual cover and part diagrams are shown in the images below. One of the few multi-model sets was the 564-piece No. 7130 Mega Sized Planes and Copters set (shown below). 7080 F-18 Fighter, Tractor, Lunar Rover, Motorcycle, etc.